Offering immediate digital based access to our commercial clients via our gallery of over 30 million images representing images from events all over the world. We additionally operate a bi-level, climate controlled, Sat TV and internet fed mobile production truck and studio trailer, allowing us to work and display onsite in ways no other firm offers. Our rig offers seven 20” customer viewing terminals, allowing customers to view their images almost immediately after capture. Products from prints to USB/DVD’s are immediately purchasable and credit cards are accepted onsite. The trailer also carries multiple all-terrain vehicles to allow our photographers efficient access to all areas of a race track or venue. 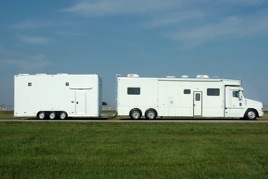 Our mobile service rig is perfect for race track events, horse shows and competitions, soccer tournaments, etc. Contact us today to schedule our photographing and display at your event.